How to tie shoe laces. Prevent your child from tripping over an untied shoe. Falls are a major cause of injuries in the home, more so than motor vehicle accidents. 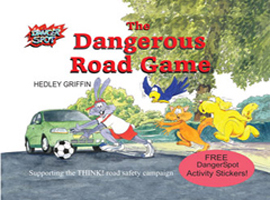 See “The Dangerous Road Game” illustrating Harey, the hare-brianed rabbit, tripping over his shoes laces. Children can easily trip over with untied shoe laces and toddlers love taking shoes on and off. If a large part of your day is spent putting shoes back on your toddler's feet then a simple trick could help. Tie a knot at each end of the shoe lace to prevent them from being pulled out. Also, if the ends become frayed wrap them in a small piece of sellotape and roll them tightly to create a new aglet.